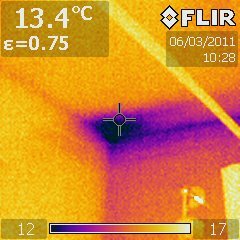 Learn how a thermal imaging survey can spot real problems. What does it cost? Is a trained operator useful? 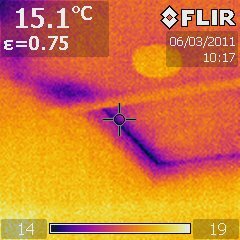 In February 2011 I managed to borrow a thermal camera for a few hours on a chilly evening. I wanted to look for cold spots inside, and hot spots outside. Both show that heat is escaping too fast. Thermal imaging cameras see infrared (IR), often alongside visible light. A camera uses the IR to estimate the temperature of objects in the field of view. Sometimes these cameras are described as 'thermographic'. IR thermometers are effectively single-point or single-pixel versions. In March I hired a professional to repeat the survey to check how effective my DIY attempt was. (And see what else might need fixing.) It cost me under £200 all-in. I was visited on a chilly Sunday morning. My amateurish attempts, and Sustainable Lifestyles' (SL) more practised eye, both discovered big problems such as the cold front door and loft hatch. Equally, both of us could see that our house is doing quite well, losing a lot less heat than neighbouring properties. Though it turned out that I was too complacent. I should have worked harder to pick out other issues. 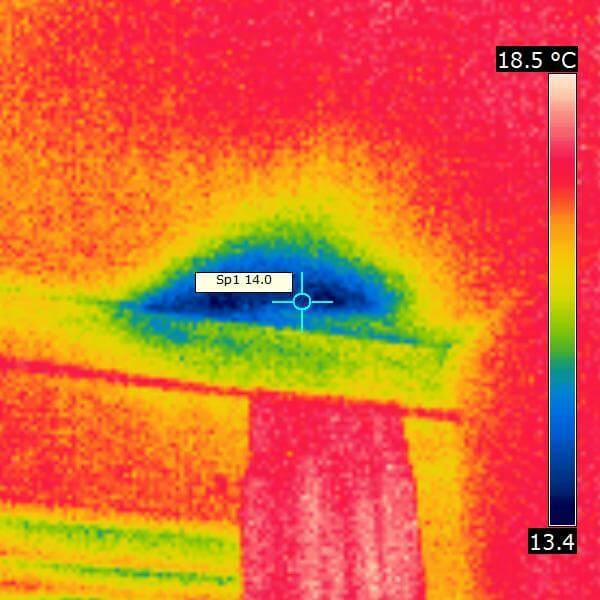 One interesting feature that stood out dramatically in both surveys was the (expected) thermal bridging of the aerogel drylining in our living room with the steel fixing screws. With some styles of rigid drylining such as Kingspan K17 where dot-and-dab adhesive fixing to the wall is possible, such bridging can be avoided. Even though the loft hatch has been draft-stripped, and I glued some insulation to its top side (the box for a small solar panel with its expanded polystyrene packing) it remains a clear weak point thermally. It may be possible to make a backing from some of the left-over aerogel. Something should be done about it in any case. Lots of things to set such as picture-in-picture or normal mode. Other less obvious things to set such as auto-ranging or fixed temperature scale, emissivity of the surfaces being examined and possibly even colour mapping. Getting these wrong or even leaving at otherwise-sensible defaults may hide subtle issues as I think happened to me. The resolution is far lower than a typical digital compact camera. You don't necessarily get much more than is visible in the viewfinder (typically 240x240). So taking notes to help remember exactly what pictures are of may help. I wasn't sure what some of my pics were after having not labelled them immediately. A thermal camera of this type typically costs something like £4000 as of 2011. So usually tricky or expensive to get hold of. If intending to DIY you need not be put off. But you should definitely give yourself plenty of time to work through the camera modes and features to get the best out of it. At least several hours. 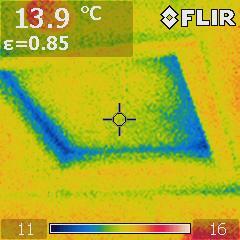 Also, try to use the camera on a pretty cold day to maximise the visibility of heat leaks. The air infiltration above the ceiling from the east/west walls to the first transverse joist in all rooms, and consequent heat loss. Even in the superinsulated living room. Heat loss from the central heating (CH) pipework. I knew that it would be an issue but it stood out. It seems that relocating any upgraded DHW/CH system could help. Heat loss from above the windows, particularly upstairs. There seemed to be a consistent and unexpected pattern of infiltration above the ceiling from the east/west walls to the first transverse joist in all rooms, and consequent heat loss. Above the first-floor ceilings, since there will have to be some ventilation of the loft space to avoid moisture build-up and rot, that may be partly unavoidable. But downstairs it may be fixable. And I'm particularly keen to avoid it in the living room which we have gone to huge trouble to superinsulate and make the "warm refuge" room for winter. This '60s house's external walls were probably not designed for air-tightness. So some infiltrations/leaks are not at all astonishing. Some ventilation is needed to keep the structural elements dry. But possibly we could make some special effort in the living room without endangering the building fabric. And in particularly cold spots elsewhere. Problem cold spots at ceiling height. I suspected that the current loft boards would be a weak point thermally. Though I could not see it on my own survey. Not only did the SL survey show that fairly clearly, but also really dramatic holes in the existing glass/rock wool insulation. Presumably where both the first and second rounds missed areas. These are typically at hard-to-reach external edges and corners. It's also clear from the SL survey that in several places joists are thermal bridges, cooling down the strip of ceiling directly beneath them. That will be hard to do much about right at the ends at external walls. But the rest in the first floor could be improved by better and more consistent insulation above them in the loft. This was something that I had not noticed at all during my survey. It would be worth at least a simple investigation if it can be done without too much mess or cost or disruption, just to see if something as simple as squirty foam would help. Eg stopping unwanted air infiltration and convection beside and above frames. A survey doesn't necessarily cost anything if you can borrow. Not much even if someone comes round to do it for/with you. So it is quite likely that you can recoup your time and effort in energy savings reasonably quickly. And it's interesting! Even if you rent your home, you may be able to get a survey for free to show you some improvements that you can make yourself. Then hand the survey results on to your landlord for the rest! I'd recommend getting in someone familiar with the equipment if you can. It really isn't quite as point-and-click as a normal digital camera. Even though it almost seems to be. Renting a thermal camera may cost no less than getting the expert to bring their own and do all the leg work. Thus it may well be worth getting the trained brain along too. None of this is to say that my own initial survey was a waste of effort. Indeed at the very least if I do a repeat in (say) a year's time, I'd have a better idea of what to concentrate on. 2011/03/07: the SL survey pointed out that our new front door is not sealing properly at the bottom, so I asked the company that installed it (Warmlite) to come and adjust it. Done 2011/03/11 in two minutes—a catch needed adjusting—for free. As a longer-term project I'll think about reducing the air infiltration above each ceiling. (Especially that of the superinsulated living room.) I'll be careful not to set myself up with condensation/rot problems for the house's timber frame. Another project would be trying to fix the heat loss seen above the windows. Maybe it would be possible to take out the reveal and do some simple remedial work such as foam filling of gaps and so on. And if we are ever replacing windows outright then we can pay extra attention to thermal bridging and losses around the frame. Images from my own survey. First published 2011-03-07 , updated 2019-04-22 . Site copyright © 2007-2019 Damon Hart-Davis. Hosted by ExNet.